The Black Swan Blog » Roof-top Solar Panels – Who Pays? Who Saves? Roof-top Solar Panels – Who Pays? Who Saves? Many jurisdictions around the world are encouraging the installation of roof-top solar panels by providing a number of financial and regulatory support mechanisms. These include direct grants to reduce the cost of installation, guaranteed prices for solar power sold back into the grid, and “net metering” whereby only the net flow of electricity from the grid to the residence can be charged for by the utility company. We need to move to a renewable energy base. Most people would agree with that. But when it comes to roof-top solar panels there are some inequities that need to be considered. Consider the two residential settings shown in the pictures. 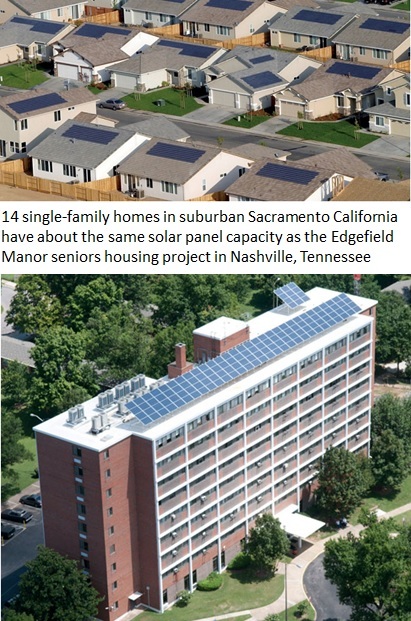 The amount of rooftop solar real estate available to the owners of the single-family houses is more than 10 x that available for the seniors living in the apartment complex. In fact, it would be quite possible for the single-family homes to generate as much electricity as they consume so that the local utility company would actually derive no revenue from these homes because of “net metering”. In the case of the apartment building this is simply not possible. In the late afternoon and into the night both the single family residences and the apartments will require electricity from the utility grid. But who pays for the generation capacity required to supply this electricity? The only people paying utility bills are the residents of the seniors apartment. But the situation is actually quite a bit worse than that. The single-family homes will generate the most electricity between 10:00 am and 2:00 pm. This is not a “peak” period for electricity demand so that much of this electricity will flow back into the grid. The local utility company will have to provide additional equipment to handle the two-way flow of electricity to and from these houses. Other equipment will be required to make sure that the “back flow” does not damage transformers and meters that may be a considerable distance from the houses. Finally, the utility company will have to implement additional procedures to deal with the intermittent nature of the electricity generated from the solar panels. For example, a passing cloud can reduce solar power generation by 60% or more in a minute or less. So the utility company will have to be able to ramp up or cut back production at some of it’s thermal generation facilities on very short notice resulting in less efficient operation of those plants and increased costs. Who will pay for this extra equipment and the maintenance of a significantly more complicated electrical distribution system? The only ones paying utility bills will be the residents of the seniors apartment. Now it could be argued that the owners of the single-family houses paid a lot of money for the installation of the solar panels and should reap the benefits in order to get a return on that investment. That would be a very defensible position to take if there were not so many subsidies associated with the whole process. Construction grants and incentives and tax write-offs are paid for by all tax-payers, regardless of whether or not they have the abillity to deploy solar panels where they live. For example, what about all of the people renting their accomodation? Feed-in-tariffs guarantee a fixed price for the electricity generated from a solar panel regardless of whether or not there is any actual need for that electricity at the time it is generated. So while the owners of these single-family houses are on vacation and not using electricity all rate-payers have to compensate them for the power generated by their solar panels whether it is needed or not. That could be a very nice revenue stream for a family that had equipped a vacation home with solar panels. And what about the good folks living in the Mid-West, Ohio, Michigan, Indiana, Vermont, New York, Maine and especially Canada? Solar panels don’t work too well when they are covered by snow! Roof-top solar panels will never allow us to actually shut down a coal-fired or natural gas-fired or nuclear generation plant. Why? Because we have high electricity demands in the late afternoon and into the night as well as on very overcast days. So we have to effectively maintain double the generation capacity actually needed. Does that really make sense? Personally I think there is a case to be made for requiring roof-top solar installations to be equipped with a significant amount of battery storage which would make it possible to time-shift the electricity generation to better match demand. The problem with that approach would be that it would triple the cost of the installation which would make it very hard to justify for a home-owner (which is why I have argued previously that these kinds of residential generation and storage facilities should be owned by the local utility). Another complimentary approach would be to provide subsidies for the construction of Concentrated Solar Power plants with Thermal Energy Storage that could be run starting in the late afternoon. All things considered the continued focus on rolling out roof-top solar without storage is misguided in my opinion. A more holistic approach which would allow us to actually decommission thermal generation facilities would be more appropriate. I have outlined a number of components of such an approach in my Sustainable Energy Manifesto. Update: after doing a bit of research I found that utilities are starting to recognize the inequities in supporting roof-top solar. The Arizona Public Service Company is proposing a service charge of $50-100/month to help offset the cost of supporting roof-top solar. In Australia similar measures are being considered. The bottom line is simple and predictable. As roof-top solar starts to become a significant part of the electricity generation mix the problems it creates are greater than the benefits. I discussed this in a previous post. Horrible approach. To begin with, solar generation is not ‘the’ problem with the SRP energy generation. Energy efficiency increases and their mass adoption, as a whole, are a problem… There are essentially three major ways to cut your energy bill… 1) Use less energy (do without). 2) Increase the efficiency of your appliances to use less energy (don’t do without, but pay up front to reduce long term costs) 3) Generate your own power. Conservation, as a general rule, in the end, doesn’t save people money… especially with utilities. infrastructure is normally the biggest expense, and you still need the infrastructure, regardless of how much energy is consumed. So, forgetting about solar, if everyone decided to go to option 1, utilities would jack up the rates across the entire base to make up the difference. You would be paying more for less. Happens all the time, especially when it comes to water. Moving to number 2… The real problem. Energy efficiency. Since we generally don’t like to give up anything, the new way to have your cake and to eat it to is by drastically increasing the energy efficiency of the millions of builder grade tract homes in America, with crap HVAC units and appliances. MOST people either have, or will be in the very near future, be upgrading HVAC systems that are reducing their electricity bills by 25%+… So, in looking at the problem, in Arizona, where there is STILL less than 2% solar home installs, what is the big problem with loss of revenue? Obviously it is the reduction in consumption from 98% of the rest of the homes. So, what do you do about it? Well, in the Arizona municipal owned coop, they give the 98% people a 4% increase, and the solar users see their bills doubled. Sound far and logical? Nope. Scape goating at its finest. So, when the total homes in America that have rooftop solar are less than 1% in total, you will find the argument IMPOSSIBLE to support factually that solar owners, in any significant way, are even in the ballpark of being a real problem, or being THE problem. Most solar owners just want fairness. And the utility companies make it virtually impossible NOT to net meter. In many cases, it would be better off for the energy producers to simply give a fractioned percentage of credit for energy sent back to the grid instead of 1:1, or stop it entirely, but there is no option. And with the rates in places like Arizona, you essentially take away almost the entire benefit of having solar in the first place. The savings just aren’t there. Thanks for taking the time to comment – informed debate is the cornerstone of understanding. I continue to believe that roof-top solar is a very inefficient and ultimately unfair way to tap into this great energy resource. Installations are more expensive than on utility-scale solar farms, maintenance issues will be ignored by many, and the relatively few individuals that own single-family dwellings and can afford to install roof-top solar will be subsidized by the majority of citizens that do not have that option. All of the details regarding my objections are covered in this blog entry and the ones it refers to.